Faye (Grabill) Schuller, 71, of Grand Island, died Sunday, October 7, 2018, at CHI Health St. Elizabeth in Lincoln, surrounded by family. Her Celebration of Life will be Monday, October 15, 2018, 6:00-8:00 p.m. at Skate Island. Faye was born December 1, 1946, at Carroll, Iowa. She was the daughter of Wayne R. & Adelaide C. (Kirk) Grabill. Survivors include her husband, Gary Schuller of Grand Island; a daughter and two sons, Tracy Lynn Adrian, Kelly Schuller, and Scott Schuller, all of Grand Island; one brother & sister-in-law, Lynn & Donna Grabill of St. Joseph, MO; one sister-in-law, Mary (Kent) Grabill of Grand Island. Others left to cherish her memory include her grandchildren, Lindsay Bogatz, Nicole Mitchell, Kelsie, and Miranda Scoggins, Braxton, Brayden, and Brody Adrian, Austin and Lauryn Schuller; great-grandchildren, Kaitlyn, Ashley, Mackenzie, and Emma Bogatz; and numerous nieces & nephews. Faye grew up in Iowa before moving to Grand Island with her family. 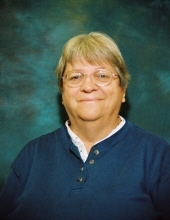 She graduated from Grand Island Sr. High in 1965, and married Gary Schuller on November 6, 1965. Lutheran Memorial Hospital and St. Francis Medical Center before attending the University of Nebraska at Kearney as a non-traditional student. After she graduated Bellevue University in 1994, Faye taught Office Technology courses at Central Community Community College in Grand Island. Faye performed in Grand Island City Singers, La Camerata Madrigal Singers, Grand Island Little Theatre musicals, and The Generation Gap - a trio group with her mother and her daughter. She was a member of Calvary Lutheran Church in Grand Island, and Lutheran Church of the Good Shepherd in Hastings. She was an avid fan of her children’s and grandchildren’s activities. Faye was front row (and taxi driver) for countless dance competitions, musical and theatre performances, ball games, and all things roller skating: derby, hockey, art, and speed. She welcomed many “rink rats” into her rinkside booth, into her home, and into her heart. She was preceded in death by her parents and her brother, Kent Grabill. To send flowers or a remembrance gift to the family of Faye (Grabill) Schuller, please visit our Tribute Store. "Email Address" would like to share the life celebration of Faye (Grabill) Schuller. Click on the "link" to go to share a favorite memory or leave a condolence message for the family.